Elizabeth Taylor wrote wrote beautiful, subtle human dramas with such lovely clarity. The stories that she told were wonderfully insightful about people and their relationships; and they reward close reading because she had such a wonderful eye and ear and because she was so very good at making every detail exactly right – and worthy of notice. This novel – her eighth – is about love. It shows different kinds of love, it shows how love can change; and it shows how love affects one family and the people around them, and how it changes them and their lives, over the course of one summer season. Kate was a young widow and she has recently married for the second time. Her new husband, Dermot, has tried a number of careers without ever finding the right one. He isn’t particularly driven, but he wants to do something, to play the role that he feels he should be playing. Kate and Dermot are happy together as a couple. Dermot has a good relationship with Kate’s son, Tom, who is working his way up in his grandfather’s business and having fun with a string of girlfriends; but he struggles with Kate’s daughter, Lou, who is back from boarding school for the holidays and hates that somebody else is taking her father’s place and making her mother the subject of gossip. Kate is fully aware of Dermot’s weaknesses, but she accepts them, and tells herself that they can be – they will be happy. But it becomes clear that their marriage has fault lines. Dermot doesn’t share many of the interests and attitudes of Kate and her friends; he feels inferior, he resents that, and he resents that he can’t quite establish himself in the position he wants. This becomes clear over the course of the summer. In the first act of this two act drama family life simply plays out. Lou is drawn to the young local curate and she spends her summer caught up with parish affairs and events. Kate’s Aunt Ethel, who lives with the family is caught up with her own concerns, but she is worried about the family and she quietly does what she can for them. In the second act Kate prepares for the return home of her best friend’s widower Charles and his daughter Araminta. They have been away since his wife died, they have never met Dermot, and Kate worries that the presence of an old friend, with so much shared history and so many common interests will unsettle him. She is right, and, quite unwittingly, Tom and Araminta, upset the precarious balance of Kate’s family. Tom is fascinated by Araminta, an aspiring model, who is beautiful, cool and distant; the first girl he wants but cannot win. And the return of her own friend unsettles Kate as well as Dermot. There is little plot here, but the characters and the relationships are so well drawn that it really doesn’t matter. The minor characters are particularly well drawn. I was particularly taken with Ethel, a former suffragette who wrote gossipy letters to her old friend in Cornwall but also had a practical and unsentimental concern for family; with Dermot’s mother, Edwina, who tried to push her son forward and was inclined to blame Kate for his failings; and with the cook, Mrs Meacock, who experimented with American food and was compiling a book. They brought a different aspects to the story, as did Lou’s involvement with the curate. There are so many emotions here, including some wonderful moments of humour that are beautifully mixed into the story. I believed in these people and their relationships; they all lived and breathed, and Elizabeth Taylor told all of their stories so very well. The summer is perfectly evoked, and this book is very well rooted in its particular time and place. I loved the first act of this book, when I read that I thought that this might become my favourite of Elizabeth Taylor’s books, but I loved the second act a little less. It felt just a little bit predictable, a little bit like something I’ve read before and I couldn’t help wondering if the dénouement came from a need to do something to end the story rather than simply being a natural end. It was love though, and I can explain away all my concerns by telling myself that stories do repeat in different lives and that lives often take unexpected turns, and can be changed by events that are quite unexpected. I’m glad that I finally picked this book up, and that I have other books by Elizabeth Taylor to read and to re-read. Very much enjoyed your review of this terrific book. Makes me want to pick it up again. 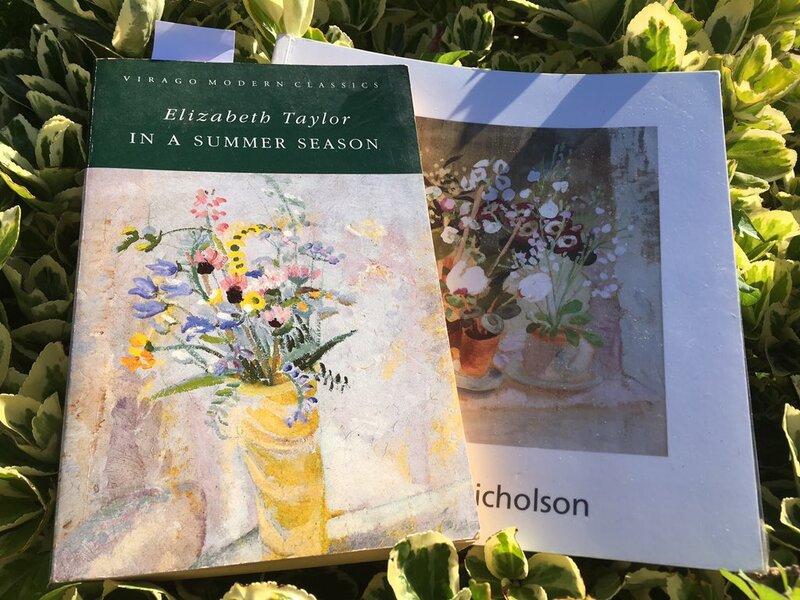 Thank you – I am sure that with the quality of Elizabeth’s Taylor’s writing and the details to appreciate this would be a lovely book to re-visit. I love this book too, for me the ending was wonderfully unexpected when I first read it. I also loved the sensual, summer sixties feel to novel which I only really appreciated the second time I read it. The season and the period were captured wonderfully well. I have mixed feelings about the ending, and I can quite imagine finding a different perspective on a second reading. She sounds like an author I might like. I can highly recommend her, and I know many others would too. The second half wanes only a little, so please don’t let me put you off trying this book. ‘A Wreath of Roses’ was my favourite Taylor for a long time and I think it might still be, though I love different books for different reasons. As I have a copy of this book on my tbr, I’m going to skip your review for now and come back to it later. She’s fast becoming one of my favourite authors – everything she writes is so beautifully observed. That’s very sensible. I’ve to not say too much, but it is difficult with this type of character -led novel. I’ll be interested to read your thoughts one day. This author is one of a handful that i re read.Classic novel. I am also re reading YOUNG ANN , MISS RANSKILL COMES HOME and PRINCES IN THE LAND. This was the first Elizabeth Taylor I read and I loved it. She so cleverly dissected the relationships. She is – she is so good at relationships and at getting every character right. Wonderful review, Jane, and you remind me how much I loved this particular one of Taylor’s novels. She so good on relationships and captures the nuances of so many different kinds in this one. Thank you – I can only agree with you. This sounds wonderful. Since I want to read everything she’s written, I’ll get to it sooner or later. She’s so good at creating fully rounded minor characters, isn’t she? Yes, she really is. I have just a few more novels to read and I’m torn between plucking them all from the shelf now and being patient and slowly savouring each one.